We are big into audiobooks in our home and I get a lot of questions about it. 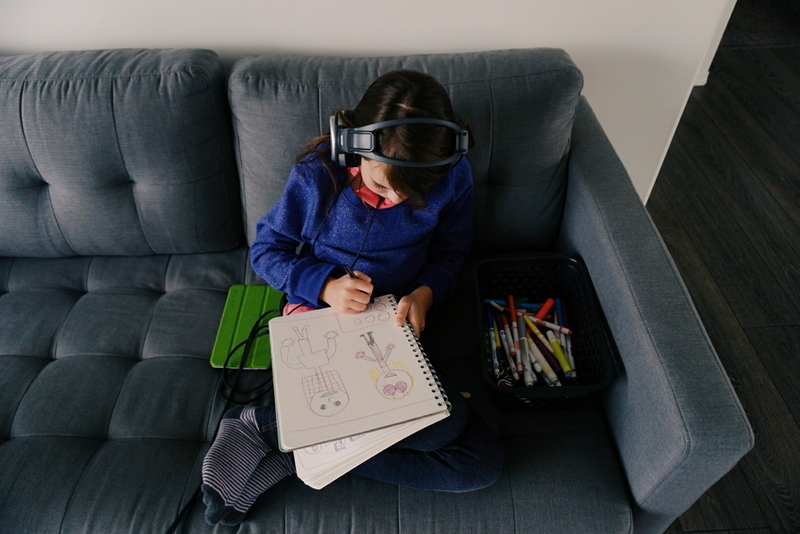 About a year ago I wrote a post about How to Incorporate Audiobooks into Your Homeschool Day but we’ve amped up our listening since then so I figured it was time to go big and share The Ultimate Guide to Using Audiobooks with Kids. 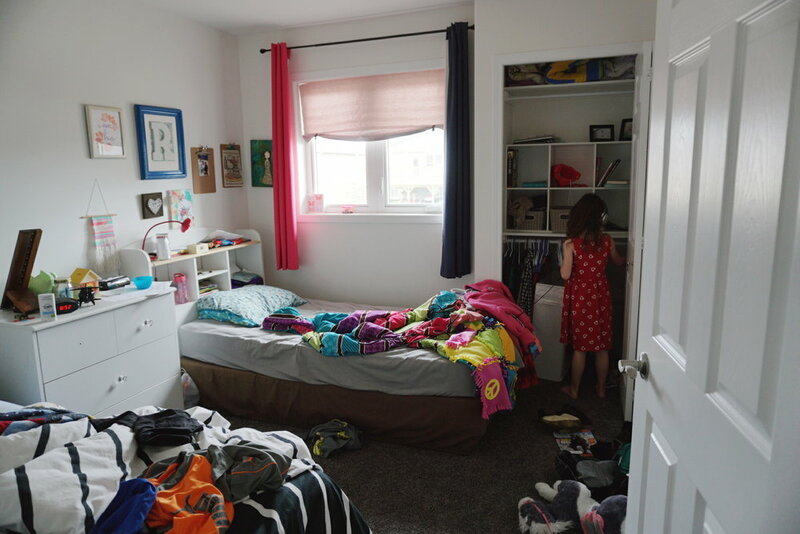 You definitely don’t need to do everything we do or even do things how we do them but I wanted to share our experience in order to help out my fellow homeschoolers. First off, let’s start with why I am so keen on audiobooks! Tips for Getting the Most From Your Library and Saving You Thousands! I’ve admitted this many times, I can read a good picture book really well but I struggle with reading chapter books aloud. While I am working on this by reading some of the easier chapter books aloud I didn’t want this struggle of mine to affect the number and quality of books we listen to. I really enjoy productivity and appreciate that our minds can be busy listening to a story while our hands are busy doing something else. Ideas on what this can be to follow . . .
Back to my issues with productivity but I find reading aloud takes me such a long time, so I’ve gotten in the habit of speeding up our books. This depends on the narrator but I find we usually put our family audiobooks on to 1.2x speed. 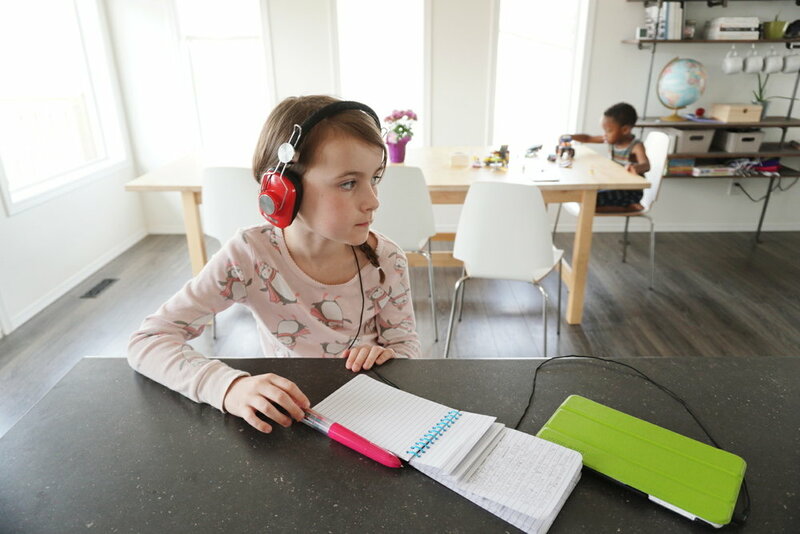 If you have headphones on it’s easier to listen at a faster speed, I usually listen at 2x for my own books and my daughter listens between 1.4x and 1.8x depending on the book. It’s also something that needs to be done gradually, you can’t just go from always listening at regular 1x speed and then jump up to 2x, you need to hit the speeds in between first or else it sounds way too fast. 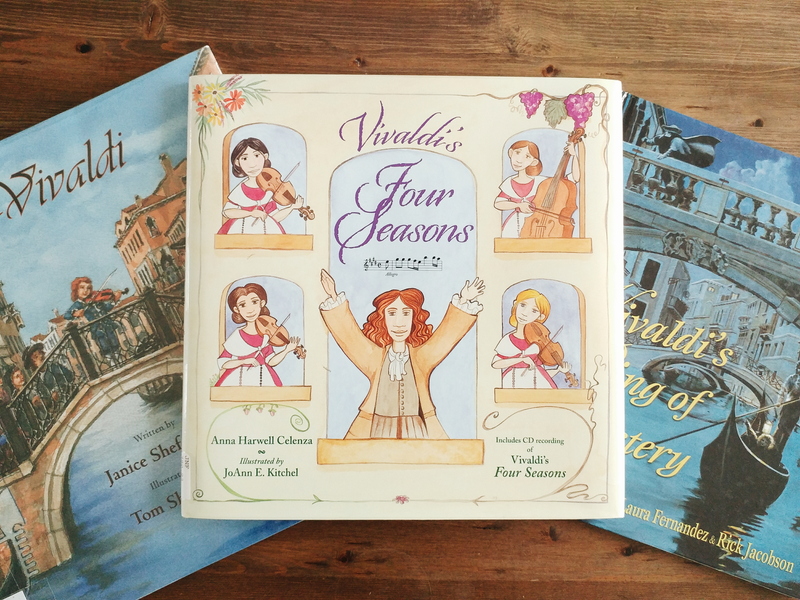 If you know that audiobooks are amazing and something you need to incorporate into your homeschool, I bet you are wondering about the best ways to listen to these great books. 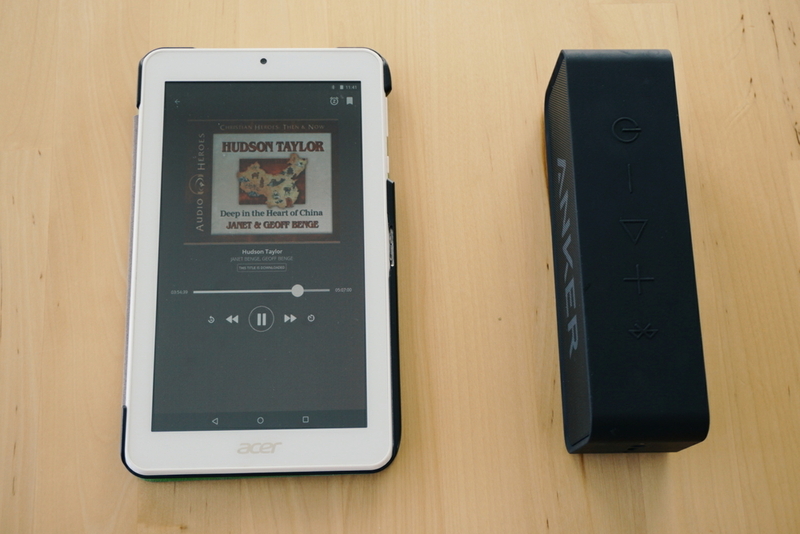 The good news is, the majority of the ways we listen to audiobooks are completely free! The first two apps we use for free via our library, the third one is free online and only the fourth and fifth ones do you need to pay for (but I’ve got some tips for you to get some of them for free or super cheap). I love this app because we can have up to ten books out at a time. With three of us listening to audiobooks quite heavily we actually use two library cards which bumps us up to 20 books at a time! Plus, they are automatically returned when they are due so we never have to worry about late fees or trying to remember when to bring them back. If your library has access to Overdrive they will only have a limited number of copy of each book so some times you have to put a hold on a book and wait awhile for your turn. Side note: I just heard about the app Libby. I thought it was another app but as far as I can tell it is Overdrive but looks nicer? I’ll update here when I’ve used it more and know more about it! Another great app our library uses! 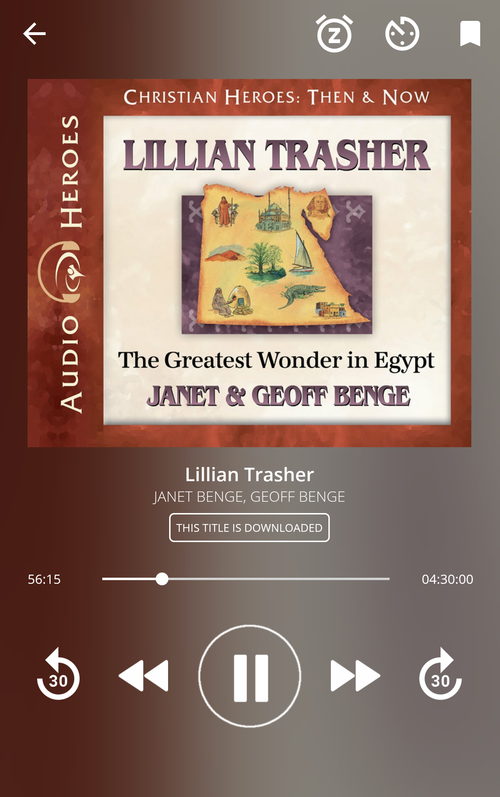 Our local library limits us to three books a month which is not usually enough for us from this app since they have a different selection than the Overdrive app (it’s where we are listening to the Christian Heroes Then and Now Series). The good thing about Hoopla though is that there are no waiting lists! If you find a book you want to read or listen to you can do so immediately. Prior to using the library apps we used the website Librivox a lot more, it’s been awhile since we’ve used it now but there are some great books to listen to for free on the site. Librivox uses volunteers to read books that are in the public domain so if you are looking for classics, chances are it will be there! Narrators can be hit and miss but we’ve always enjoyed Kara Shallenberg. If we can’t access an audiobook we want from any of these sites I will consider purchasing it from Audible. There aren’t many books we re-listen to so for that reason I prefer to not buy them. If I do buy one off of Audible I make sure I don’t pay more than $5. The Green Ember was a book I kept waiting for our library to get and they never did so I bought it on Audible when it was on sale for a few dollars. The nice thing about Audible is, if you haven’t already done their free trial you can get some books for free! Or, you can just buy the discounted books when you find them and you don’t need a subscription. Plus, sometimes if you already have the ebook you can get the audiobook for just $0.99! We also use Epic Books at times to listen to books. They have a pretty good selection of picture books which kids can listen to and look at the pictures at the same time. They also have some audiobooks for older kids but not as much selection for audiobooks for older kids as the other apps I’ve previously mentioned. Epic does come with a monthly subscription but they often have deals for you to get the first month free. I would definitely recommend looking into Epic and seeing if it’s something you want to incorporate into your audiobook arsenal. WHEN TO LISTEN TO AUDIOBOOKS? Now that I’ve shared our favorite sites/apps for audiobooks let’s get into when to listen to them! We listen to a few of books a month by implementing the following methods. Actually before I get into this list I should just mention that we usually have one audiobook on the go that we are listening to together as a family (minus my husband who is usually at work while we are listening) and then the kids and I also have individual books we listen to. We listen via this bluetooth speaker. For individual listening I use my phone and headphones and the kids have old tablets and headphones. I’m looking into getting us all bluetooth headphones so we can walk around more but first we have to do a little saving, I’m still using the headphones that came with an old phone I bought six years ago, it’s about time I got some new ones. This is my favorite one, because I may have one child who is a bit of a chatterbox. Listening to books at meals began as a way to get her to actually eat her food instead of just talking through the entire meal but quickly turned into something we enjoyed. For about a year we only listened at lunch time (20-30 minutes a day) but over the past few weeks we’ve started listening at breakfast too. Often we will be so into a book we will sit at the table for awhile after eating or my daughter will pull out a paper to draw on, which brings me to the next one . . . There are so many things a person could do while listening to a book: drawing, coloring, playing Lego, driving cars (as long as there aren’t too many car noises 😉 ), making perler bead creations, etc. Anything that is fairly mindless could be done at the same time. I have a list of more than thirty ideas of things you can do while listening coming out soon! If we are going to be in the car for more than five minutes we’ll put our current book on to listen to. 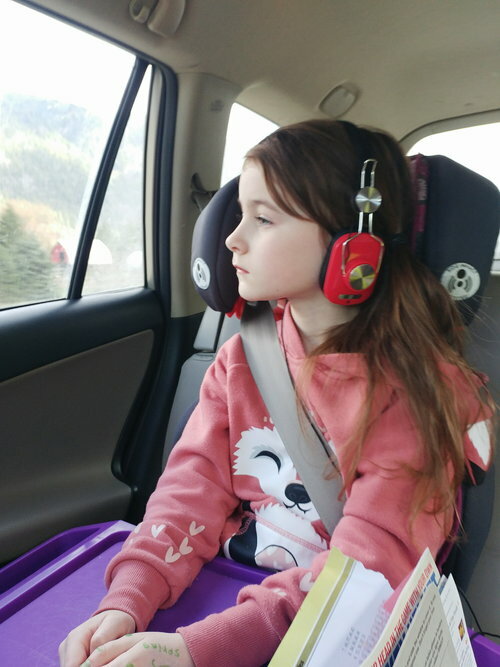 When we are on road trips we can listen to hours worth of audio but it’s amazing how much we can get through on a day when we are just running errands, five minutes here and ten minutes there adds up! Sometimes on road trips the kids will listen to their individual books as well. It makes the vehicle so quiet and Jared and I can actually have a conversation without kids inserting their two cents every few seconds. It’s pretty much like a road trip date. This started not too long ago because my daughter usually reads for an hour before bed but my son isn’t quite reading yet and he was getting sick of looking at the same books over and over again, so he started listening before bed and it has made that time of day less of a struggle and has helped to settle him down before bed. Those are our main listening times, if you have other times you listen to audiobooks, I would love to hear them! 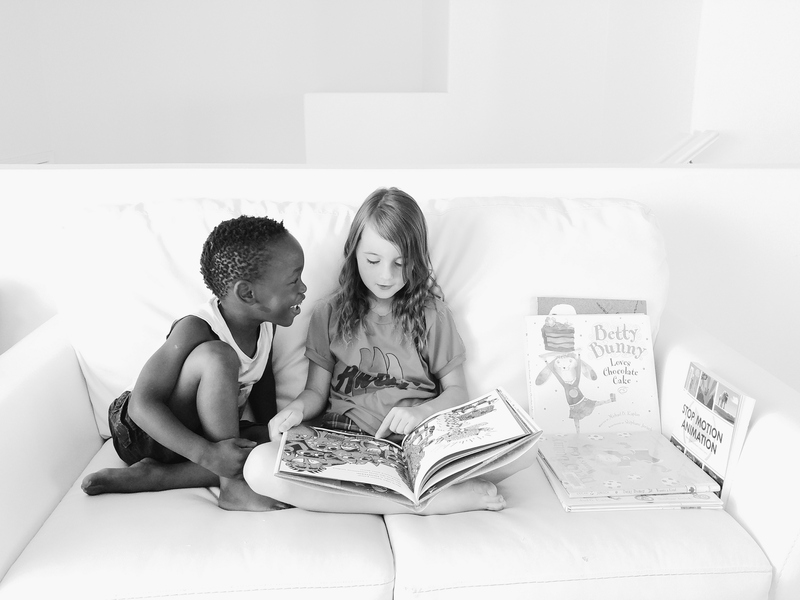 If you need some audiobook recommendations, you can check out my list of best audiobooks for young children, audiobooks for grade one and audiobooks for grade two.